Well it’s been a busy couple of weeks for me on the wedding cake topper front! After returning from a holiday in Dubai, I had a special cake topper to make for a certain Mr Rob Ellis – presenter of the Capital FM Breakfast show! As an avid listener, I was really pleased to be given the opportunity to make the topper, which consisted of Rob and his wife Lisa as well as their 3 children, dog and cat! 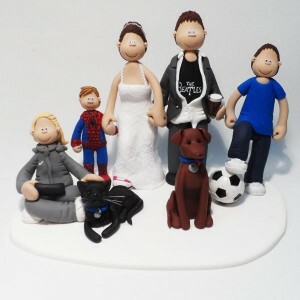 The topper wasn’t the first celebrity wedding cake topper I’ve made, I’ve been lucky to have also created the toppers for former Man Utd footballer Wes Brown, former Hollyoaks’ characters Calvin and Carmel, and also a topper for Tracy and Steve from Coronation Street! Keep checking back to the website for more celeb toppers!